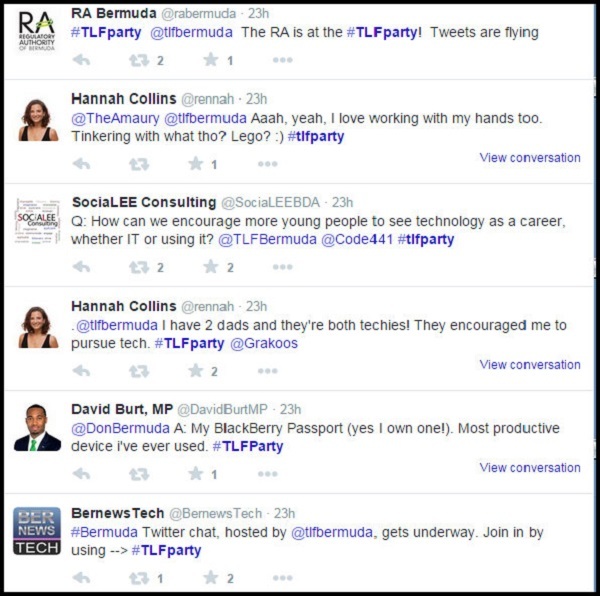 The Technology Leadership Forum [TLF] hosted Bermuda’s first-ever Twitter Party last night [Feb 17] using the Twitter hashtag #tlfparty. The TLF said, “This virtual party also included an in-person meet-up at Café Ten for it’s members and students, providing an informal and fun opportunity for ICT professionals to network in a buzzing technological environment. Given the reach of the event and the amount of people taking part it was deemed a success with regards to achieving the organizations goal of advancing technology locally. “Through harnessing the collaborative technology of Twitter, the TLF party was able to reach out and expand the social gathering to include individuals looking to participate from wherever they were, anywhere in the world! “The theme of the party was “Strengthen your Roots” – which encouraged the audience to honour who they are, where they are from and to educate themselves in order to build lasting leadership careers in technology. “At 5:30pm, the conversation began with a number of questions that were posed by the TLF and Twitter Party participants. The international accessibility of the event was perfect for those students interested in technology who may be studying overseas or even ICT professionals in other areas of the Globe. “It also allowed for a comprehensive overview of the most topical issues and subjects. Throughout the gathering at Café 10 there was a large screen displaying all of the action on Twitter as the physical audience engaged with the virtual audience. “Some of the Twitter topics from contributors included discussing the various technology they use, the need for IT mentoring at various age levels, programming languages being used, and the TLF Summer Internship Programme, as well as many other educational and insightful technology topics. Sandra De Silva, Chair of the TLF shared: “These are amazing statistics for the TLF’s first Twitter Party in Bermuda. We look forward to engaging all technology enthusiasts in the future.” Thanks to all who participated, as wells as to our Alumni for their support, our event sponsor NOVA and ITS for providing the large screen TV to showcase the Live Tweeter Feed. The TLF continues to look for dynamic college and university students for its Summer Internship Programme. Ideal students should have a passion and dedication for ICT. Students are encouraged to apply now for the 2015 Summer Internship Programme and become a part of this exciting industry. Given this was the TLF’s and Bermuda’s first-ever Twitter party we can expect to see this an even bigger event next year and maybe even a more common event theme in Bermuda going forward. More information will be available as the TLF’s youth program advances. For more information about the TLF, please visit tlf.bm. and Government is using its resources for this?? really?? Perhaps an IT firm should be a sponsor. Dept of E-commerce really needs to be wound up at this point. Save us a few more million in futile spending. For your information, a private sponsor did in fact cover the cost of the event. Indeed we receive an annual grant from Govt like many other organizations to assist with funding the annual TLF a Internship program. This is, in addition to sponsorships from private companies. The TLF a Internship program has successfully graduated 40 plus IT students since its inception, many of whom were able to secure excellent IT jobs after graduating. I hope that you are now sufficiently informed.